Total revenue at Yum! Brands slipped 6 percent for the quarter as the Louisville, Ky.- based fast-food company was dragged down, once again, by its Pizza Hut division and the KFC supply-chain disruption earlier in the year in the United Kingdom. Combined same-store sales at all three brands increased 1 percent for the quarter ended June 30. CFO David Gibbs said the 1 percent increase at Yum would have been 2 percent after adjusting for the impact of the supplier disruption at KFC stores in the U.K. Stores didn’t reopen until mid-May, following a massive supply failure that left nearly 900 restaurants without their core product. Same-store sales at KFC and Taco Bell grew 2 percent. Pizza Hut same-store stales were down 1 percent. 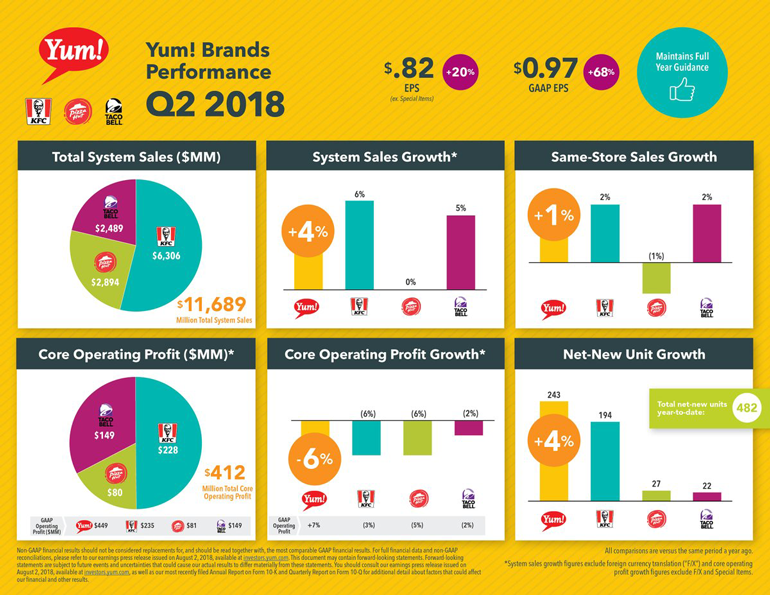 Yum reported total revenue of $1.37 billion, down from $1.47 billion for the same period last year. Net income increased to $321 million, up from $206 million for the prior year, same quarter. In the U.S. same store sales at KFC grew 1 percent. “I know we can and will do a lot better,” Creed said of the KFC division. Pizza Hut reported nearly flat systemwide sales of $2.89 billion, up slightly from $2.82 billion for the same quarter last year. International same-store sales dipped 2 percent, while U.S. comps were flat. Taco Bell, typically the company’s best performing brand, reported systemwide sales of $2.48 billion, compared to $2.37 billion for the prior year. Same-store sales at Taco Bell were up 2 percent, compared to 4 percent for the previous quarter last year. For the quarter, Taco Bell opened 43 new restaurants, including 9 new international restaurants. The chain closed the quarter with 6,905 restaurants as it aggressively tackles a goal of reaching 9,000 units by 2022. Earlier today, Irvine, Calif.-based Taco Bell updated its growth plans, including accelerating its urban and Cantina concepts in New York. CEO Greg Creed said Taco Bell saw a boost from the return of the Naked Chicken Chalupa during the quarter. At the end of the quarter, Taco Bell also brought back Nacho Fries, which broke records when it was first introduced as a dollar item earlier this year. It is now being sold at a higher price point — $1.29 in most markets. It is now an option among the chain’s popular $5 Box combo deals. Taco Bell “proudly stands in a category of one,” Creed told investors during a conference call Thursday morning. Going forward, Creed said Yum will focus on driving each brand’s value message, something that was lost at Pizza Hut during the quarter. 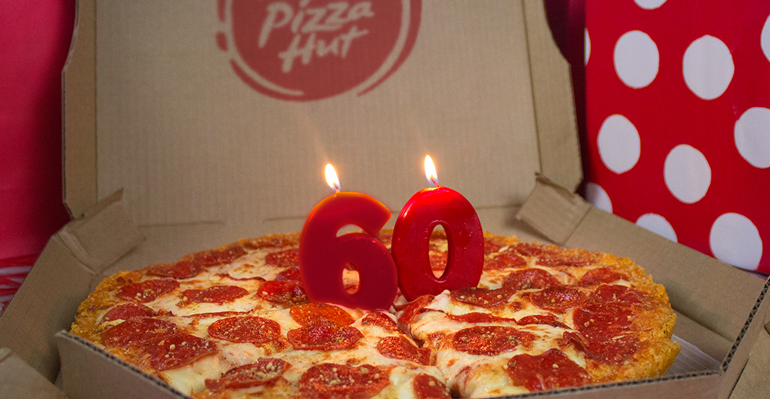 Creed said that during the quarter Pizza Hut introduced Double Cheesy Crust Pan Pizza to celebrate its 60th anniversary. The premium product was a success, but ultimately acted to shift the brand’s marketing away from Pizza Hut’s value offerings, Creed said. That “weighed on same store sales growth,” he said. Creed said the brand is adjusting to remind customers that Pizza Hut offers a daily “compelling” value. Mark Kalinowski of Kalinowski Equity Research said large scale brands are still struggling in a favorable economy. Competitive value deals in 2018 have also challenged fast-food and casual dining operators. “This just goes to show that even with an arguably better U.S. economy, this isn’t necessarily translating into broader better same-store sales trends for large U.S. restaurant concepts,” Kalinowski wrote in a report after the conference call. Analysts pressed YUM executives about delivery effort in the U.S.
Gibbs and Creed said Taco Bell and KFC are still in the early stages of testing, but so far they are pleased with the early results. The declined to provide specific sales data tied to delivery, including Taco Bell’s new relationship with Grubhub. Both KFC and Taco Bell are still working through the kinks of integrating delivery with POS systems, and improving delivery times. Once those issues are worked out, Creed said the company will put “muscle” into marketing delivery — something it has yet to do. Still, he knows that delivery is key to driving new customers to each brand. Though transactions are small, he said early data shows that delivery adds a “new occasion” and drives higher check averages.